In the world of designer handbags, Chanel was my first love and will always be timeless. However, I have to admit, the Céline corner of my collection has been getting the most wear over recent years! Their classic box bag or luggage tote up the chic factor of any outfit, and if I had to pick another favorite, it’d be the belt bag which I first reviewed here. This latter bag in my opinion is one of the most underrated styles in the designer purse world – the design is minimalist and sharp, it’s fairly lightweight for Céline, and the style is convertible and functional (can be worn on the shoulder, cross-body, or hand-held as shown below). Yet somehow, I almost never see anyone around town toting this style! For today’s partnership with Trendlee, I borrowed this gorgeous pre-owned Céline belt bag in the “micro” size from their inventory to feature. It’s in pristine condition and petite-proportioned, in an elegant combination of neutral pebbled leather with light gold hardware. If I didn’t already have a few bags in this same color of textured leather, I would’ve definitely bought this beauty at the pre-owned price. If you’re looking for a different style or brand, Trendlee has a big selection of pre-owned designer bags, with new arrivals every week. See my older posts featuring a red Prada bag or a Saint Laurent satchel from their collections. I like that they provide large and clear photos of the actual item for sale, detailed info on condition, and a third-party authentication certificate for each handbag. Since size can be hard to gauge when shopping online, they include measurements as well as a size reference photo of each bag standing next to a shoe (which I find to be quite helpful!). I’ve curated some of my favorite classic styles on this page – you can use the code EXTRAPETITE17 for 5% off your purchase through October 20th (UPDATE: this has been increased to 10% off from 9/21 – 9/25 only!) . Happy shopping, and let me know if you end up checking anything off your bag wishlist! Thank you to Trendlee for partnering on this post. The bag is soooo cute, I love how you matched it with your outfit too! Just wish I could afford designer handbags, haha! I always promote high quality bags as a cornerstone of a great wardrobe . If you care for your bags well they will last until you tire of them! Then a gently used bag be sold and help you to purchase your next bag !! Again you look great in this post , nice tone to your clothes and photos ! Hi Jean! Can you recommend a comfy tunic length sweater to wear with leggings for at home or running kids to activities? I am the same measurements as you. Just want it to cover my rear and be appropriate for running about…Thanks for any suggestions! Hi Ann – I don’t know of any off the top of my head that are currently available, but I’ll keep my eyes peeled for good tunics this season! I absolutely love the neutral colours, they all go together so well! That duster looks beautiful too! Your styling is ON POINT 💞 Love the way all the pieces look good together. Love your blog! This outfit is put together so well. I subscribed to your newsletter a tad too late. I was wondering where you bought the black jumpsuit featured in your Instagram stories the other day. I’ve been on the lookout for something similar. Could you pls. let me know? Thanks. Forwarded you the email and will post more photos of it this week. I hope you’ll like it! Love your style! 🙂 You’re so stylish. I love how you style both high end and affordable clothing! You’re amazing. Hi Adriana! Aquatalia boots are amazing … which style and color did you get? Was it the pair from the Nsale? I don’t usually wear mine with pants except when commuting in the winter, since it looks a little too equestrian on me that way. I do love mine with skinny jeans or with black tights and and dresses, though. I’ll keep your request in mind for posts later this fall /winter! Hi Jean – can you recommend a good spray to protect your designer bags from scratches and water? I had previously bought one from Nordstrom but when I tested it on a navy givenchy bag it left somewhat of a mark (tested bottom of bag); not too noticeable but it’s there. Hi Aubrey! I think the one that I use is the one you already have … is it the Cadillac brand leather and suede protectant spray? I’m sorry to hear it might’ve left a mark! Unfortunately I can’t be of more help since that’s the only one I’ve recommended. This bag is super cute! <3 🙂 I love it so much! 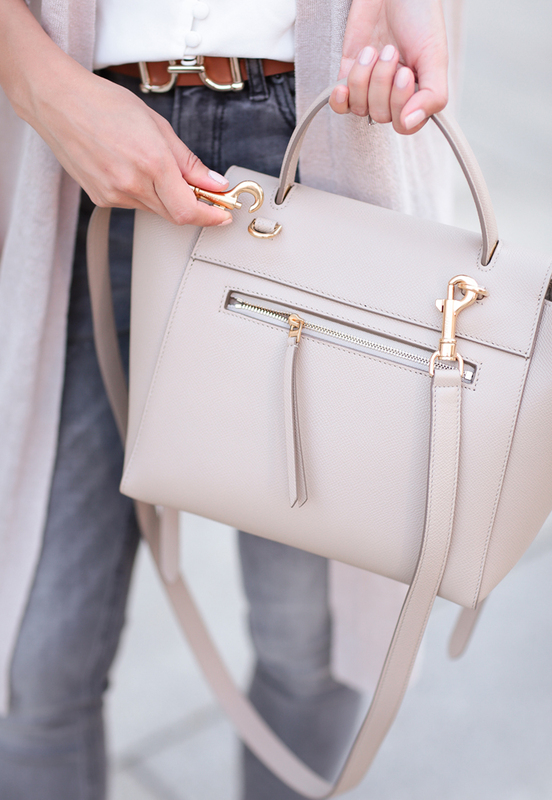 The shape and structure of it definitely sets it apart from other Celine bags! And I love the outfit that you're wearing! Love neutral colors and they look amazing on you dear! I like the handbag, very classic and elegant and I believe a lot of things can fit in. Love the outfit and the soft tone palette. That Celine bag looks beautiful and streamlined. Can you please share where I can get the delicate necklace combo you’re wearing here? I just love them! Thank you – great post, love all the neutrals! Obsessed with that bag! And the duster is perfect! <3 Definitely copying this entire outfit. I am also wondering where I might find your necklaces. Just about to order the sweater in tan. Love the look….love your style. Thank you. Love your look! Long layers are so flattering on petites! Really does the job elongating! Your blouse is so cute! Love the button details. Also love the belt. Where are they from? Have you tried Reformation yet? Would love to hear your thoughts! Love the outfit! Where is the white top from and what do you wear underneath so your undergarment don’t show? I always have a hard time wearing anything white. What’s your secret?